An interview with Marc Bauder, the director of Master of the Universe and creator of the Lichtgrenze (meaning border made out of light), the 8,000 glowing balloons that marked the former route of the Berlin Wall on the 25th anniversary of its Fall on Sunday 9/11/2014. Light artist Christopher Bauder and his filmmaker brother Marc began working on the concept for Lichtgrenze seven years ago, before the 20th anniversary of the Fall of the Wall. I talked with Marc Bauder about Lichtgrenze in Berlin 25 years after the Berlin Wall fell down and the premiere of his latest documentary Master of the Universe (distributed by CineDoc), which premiers in Greece and four other countries (France, the Netherlands, Poland and Italy) and was recently nominated for the European Film Award 2014. 1. From Concrete to Baloons, Berlin after 25 years. What's the difference? 2. What made you think about the Baloons, and what was the challenge about this project? 3. Greece is in a very bad financial situation. Many Greeks feel that it is mainly the Germans who set the rules in their country (financially and in politics). What is your opinion? 4. Do you have a special message for the Greek premiere of Master of the Universe and your Greek audience? 5. You are very interested in financial stories - what is your next project about? KISMET explores the phenomenal success of Turkish soap operas from Turkey to the Middle East, North Africa and the Balkans, capturing their poignant impact on women across the region. Kismet by Nina Maria Paschalidou premiert at idfa 2013 in November, it was one of the documentaries of ARTE for the special Theme Week "Starke Frauen", Power Women and was broadcasted on Sunnday March 9 under the title “Kismet, Emanzipation auf Türkisch”. In Istanbul, Cairo and Abu Dhabi, the film discovers how prime time Turkish soaps are breaking taboos and inspiring women to change their lives. In ‘Fatmagul’, a woman is raped but finds the courage to take her case to court. In ‘Life Goes On’, a girl is forcibly married to a 70-year-old man. In ‘Noor’, the protagonist suffers before discovering true romantic love, and in ‘Suleiman the Magnificent’, our sympathies lie with a Christian slave who becomes the most powerful woman of the Ottoman Empire. The film uncovers how these melodramas are capturing Muslim audiences by showing how Turkish women handle modernity. Featuring unprecedented secular liberties -extramarital affairs, women struggling to assert themselves in the workplace, divorce- these soaps also question current practices, such as arranged marriages, violence against women, child marriages and honor crimes. Kismet will make its Greek premier at the Thessaloniki Doc festival on March 20 and 23, it will make an Avant-Premiere on Tuesday 25-3 during the Festival du Film Francophone in Athens and after that starting March 27 it will be distributed by CineDoc (Rea Apostolides, Aura Georgiou and Dimitra Kouzi) in the cinemas in Athens (Danaos and Sporting) and Thessaloniki (Olympion). Konstantinos Georgousis was born in Athens, Greece in 1980. 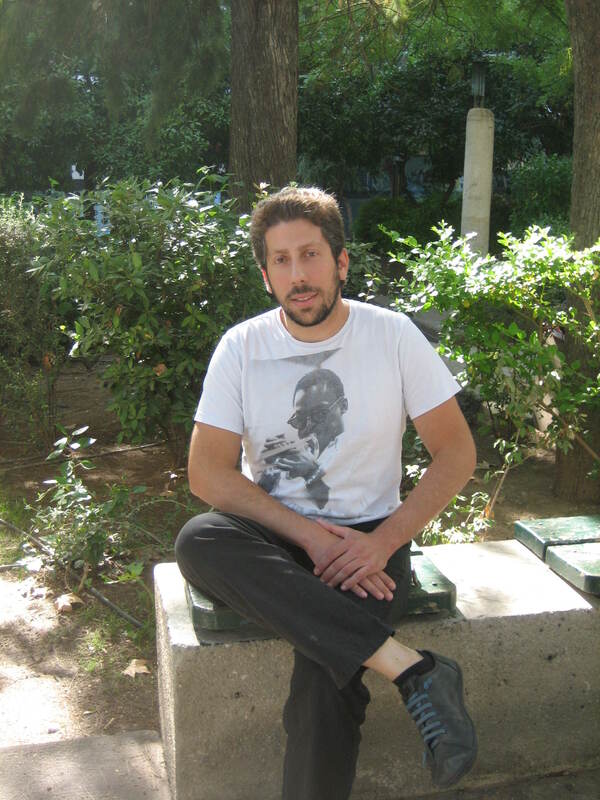 He holds a degree in Social Anthropology from Pantion University, Athens. In 2007 he continued his postgraduate studies in Visual Anthropology and Ethnographic Documentary at the University of Manchester, UK. Having discovered his passion for documentary, he joined the National Film and Television School. He graduated from the school in March 2013. 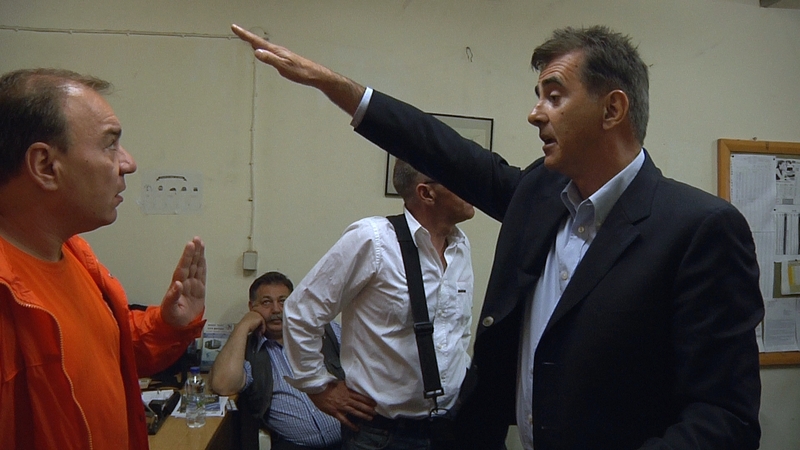 His latest film, “THE CLEANERS” follows the pre-election campaign of the neo-Nazi party “Golden Dawn”. What was the role of the Greek media with respect to the Golden Dawn in your opinion? In the beginning, about one and a half year ago, the Greek media were a bit ignorant of the neo-Nazi identity of Golden Dawn. A lot of journalists were treating Golden Dawn as a common political party, let alone that some journalists and TV broadcasters supported them intentionally. Moreover, they were presented as a tough attractive life style for youngsters and so on. Lately, especially after the arrests, corporate media became more critical and try to expose the Nazi past and present of Golden Dawn. However, there are still a lot of awkward approaches, since a lot of reporters have no idea who these people really are. You are a Visual Anthropologist – how do your studies influence your point of view and your approach to your film, The Cleaners? As a visual anthropologist I am trained to approach every social context quite differently than the majority of journalists and directors. I have developed extreme patience and the ability to live with aggressive people for extended periods of time. The anthropological technique helped me approach Golden Dawn members slowly and with the necessary persistence I managed to gain access and film them. It is “participant observation”, a method initially applied by anthropologists and now wide spread in other social sciences, that helped me coexist with Golden Dawnists. What does the film show and what does it not? In the movie you can watch Golden Dawn members being openly racist in front of the camera and actually being proud of it. You can see the banality of their cruel and vulgar behaviour, full of resentment. Their need for scapegoats and victims is more than obvious. You will not see knives and killings or any actual physical violence. What are your sources of inspiration? Which issues in Greece interest you? That’s a very difficult question to answer. My interests are not limited around politics like the neo-Nazi movement for example. I had a great interest in the Golden Dawn issue as I have experienced their politics since I was an adolescent but now I want to move to different issues. For me it is not the issue that it is important but the aesthetics of a film which actually make the movie work. Having said that, every issue can be turned into a good film if the director knows what he/she is doing and tries to make a movie and not reportage for TV. What is it that makes you prefer to live outside Greece? Living abroad is not that easy as Greeks believe but there is a big difference, especially being a director, compared to living in Greece. In our country there are not enough “critical minorities” involved in the art world or even in academia. There are not enough specialists willing to build a context in which artists and thinkers can operate creatively. I write better film proposals when I live in London that when I am in Greece. I think Greek society is very conservative and people who want to do something different can easily disappear in the wrong context. I want to make films with Greece as a location but not live in the country. What’s your take on the state of political affairs in Greece today? What would you change in the country’s policy if you had a magic wand? I am sure the biggest problem of Greek politics is definitely the presence of Golden Dawn in the parliament and the increasing support to the extreme right in general by Greek society. It is inconceivable to hear MPs deny the holocaust and who are openly Nazis inside the parliament of the “cradle of democracy”. It is disappointing to watch Greeks becoming fascists so easily. What is the role of aesthetics in a documentary film? Aesthetics for a film is almost everything. Stories are important but actually not that important. Through the aesthetics of a film, through image and sound, our perception changes and that is how we become able to experience a film and live the apocalypse of it. Documentaries which stand on the side of journalism are indifferent to me. I do not believe that revelations are important for a society. How did you intend the filming and the shots you chose for The Cleaners to function? I want the audience to be able to experience the film like being on location with Golden Dawn members. That is why the film is purely observational. I want people to feel the resentment of the neo-Nazis and in the end to feel that they cannot take more. I tried to make a film with good aesthetics so the audience can feel the sense of place, the neighbourhood and not only listen to what people say. It is more important how the film looks that what the characters say. That is why I don’t like interview films which are often very dry and the sense of place is absent. What is your opinion about script in documentaries – does it fit cinéma vérité? The script in observational cinema is a challenging issue. When you propose an idea to a production company you have to prove that you will follow a certain path so commissioning editors will give you funding. But life is unpredictable so an observational movie is always made on the way and it’s always transforming. I do believe though that the director should know where he/she is going especially in terms of aesthetics and form of the film. Script in the sense of fiction movies and storyboards are almost impossible to be prepared in observational cinema. Your model is Victor Kosakovsky. How did he inspire you in this film? Kossakovsky is kind of a lonely fighter in the documentary industry. But we do need people like him. Without directors like Kossakovsky the art of documentary would have died already. I cannot say that The Cleaners is a Kossakovsky type movie, this would be stupid. But I was always bringing in mind some of his rules that I also want to apply to my next projects. That the aesthetics of cinema are always a priority, that the basis of cinema is image and not really what people say and that films need to have something to show, not something to say. Even if somebody does not follow exactly his rules you always become a better filmmaker if you listen to him. What has your film’s trajectory been so far? The Cleaners premiered at IDFA last year in the student competition section and the film was also screened at the same festival as one of five films that are important for Europe currently. It was a special screening of the “Vrij Nederland” magazine. It won the special Jury prize of the Sarajevo film festival in August 2013. It has also being screened in smaller festivals. Part of it was broadcasted by Channel4 in England and it was also screened on a special workshop at the “Topography of Terror” museum in Berlin last spring. Now the film premieres in Greece and it also sent in other festivals around the world. What are the advantages and disadvantages of doing, as you have, a Master’s degree at the British National Film and Television School? The NFTS is an amazing film school. I would suggest to any of my friends to study there without a shadow of a doubt. It is a unique community of people and it has cutting edge equipment. I can’t really think of any negatives in the school. It’s just a bit industry oriented but this is not necessary negative. Maybe people who want to follow a more “arty” career will find NFTS is more of an industry school but in my opinion any student can find a personal pathway and actually the tutors who have a huge experience leave us do whatever we like. The films students make in NFTS are actually quite diverse. Το CineDoc παρουσιάζει τη θεματική ενότητα North Meets South που προβάλλει βραβευμένα ντοκιμαντέρ από χώρες της Σκανδιναβίας (Δανία, Φινλανδία, Νορβηγία και Σουηδία, από 6.2 - 6.3.13) με το αφιέρωμα στη Φινλανδία, σε συνεργασία με τη Φινλανδική Πρεσβεία. Από μια χώρα με ατέλειωτους, σκοτεινούς και κρύους χειμώνες, μια κωμική αλλά και συγκινητική ματιά στη ζωή και την καρδιά Φινλανδών αντρών, που μέσα στη σάουνα ξεγυμνώνουν τις αγωνίες, τις χαρές και τις λύπες της ζωής τους. Συνήθως με ένα ποτό στο χέρι, οι ιστορίες κυλούν αβίαστα η μία μετά την άλλη, φανερώνοντας την τρυφέροτητα και την παιδικότητα των Φιλανδών. Μετά την 1η προβολή θα γιορτάσουμε με fingerfood από το εστιατόριο Safka. Παράλληλα, όλοι οι θεατές με εισιτήριο CineDoc θα μπορούν να απολαύσουν ένα ειδικό μενού CineDoc δύο πιάτων στο Safka ως τις 15 Μαρτίου (Κυριακή-Πέμπτη). Επίσης θα κληρώσουμε μια δωρεάν επίσκεψη στην σάουνα και το τζακούζι του Coccon. Τα δύο ντοκιμαντέρ θα προβληθούν παράλληλα την Κυριακή 3 Μαρτίου 2013 στις 15.30 και 16.30 στον κινηματογράφο Δαναός. Τηλ. : 210 69 22 655..
Προπώληση εισιτηρίων στο βιβλιοπωλείο ΙΑΝΟΣ (Σταδίου 24).Τιμή εισιτηρίων: 6 ευρώ. Με αφορμή τη Διεθνή Ημέρα Μνήμης των Θυμάτων Ολοκαυτώματος στις 27 Ιανουαρίου 2013, Tο CineDoc προβάλλει σε συνεργασία με την Πρεσβεία του Ισραήλ, το Ινστιτούτο Goethe στην Αθήνα και την Cool Culture το ντοκιμαντέρ “A Film Unfinished”. Στο τέλος του Δεύτερου Παγκοσμίου Πολέμου, ανα-καλύφθηκαν 60 λεπτά ανεπεξέργαστου φιλμ σε ένα γερμανικό αρχείο στην Ανατολική Γερμανία. Είχε γυριστεί από τους Ναζί στη Βαρσοβία, τον Μάιο 1942, και η ετικέτα έγραφε “To Γκέτο”. Πρόκειται μια καταγραφή της ζωής στο γκέτο της Βαρσοβίας, το οποίο αποτέλεσε τόπο εγκλεισμού περίπου 300.000-400.000 ανθρώπων σε μια περιορισμένη περιοχή της πόλης. Το 1998, ανακαλύφθηκε ακόμη μια μπομπίνα. Το ντοκιμαντέρ παρουσιάζει ολόκληρο το ανεπεξέργαστο υλικό αυτής της μπομπίνας. Χωρίς να προσπαθεί να προκαταβάλλει τα συμπεράσματά μας, ο σκηνοθέτης δείχνει πώς αυτό που θεωρούμε απόλυτη αλήθεια δεν είναι πάντα εκείνο που φαίνεται. Η ταινία κέρδισε το βραβείο Μοντάζ στο Sundance Festival και το βραβείο καλύτερου ντοκιμαντέρ στο Hot Docs Documentary Festival στο Τορόντο και προβάλλεται με ελληνικούς υπότιτλους. 27.1.13. στις 15.30 το μεσημέρι πληροφορίες τηλ. : 210 69 22 655. Breath of the Gods στη Θεσσαλονίκη! Συνεχίζεται η προβολή Breath of the Gods – A Journey to the Origins of Modern Yoga στη Θεσσαλονίκη στην αίθουσα Παύλος Ζάννας καθημερινά στις 17.15. Μετά την τεράστια επιτυχία στην πρώτη εβδομάδα προβολής του στην Αθήνα με 1500 εισιτήρια και μάλιστα σε έναν κινηματογράφο και μια μόνο παράσταση καθημερινά στις 15.30, το ντοκιμαντέρ Breath Of the Gods, A journey to the origins of modern Yoga συνεχίζει την προβολή του στην Θεσσαλονίκη. Λένε λοιπόν ότι όταν είμαστε έτοιμοι ο δάσκαλος εμφανίζεται στον δρόμο μας. Ο σκηνοθέτης Jan Schmidt-Garre μας δίνει την ευκαιρία να γνωρίσουμε μέσα από το ντοκιμαντέρ του τους σύγχρονους μύθους της σύγχρονης Γιόγκα του 20ου αιώνα B.K.S. Iyengar, Pattabhi Jois, T.K. Sribhashyam και T. Krishnamacharya μαζι με σπάνιο αρχειακό υλικό. Από τον Pattabhi Jois, ο Jan μαθαίνει τον «χαιρετισμό στον ήλιο», από τον Iyengar την «άσανα» με τη στήριξη στο κεφάλι και στο τέλος ο Sribhashyam του φανερώνει το μυστικό του πατέρα του T. Krishnamacharya: «Life Saving Yoga Session», η γιόγκα που σώζει ζωές. Η ταινία του Jan Schmidt-Garre (100') είναι μια ανεξάρτητη Γερμανική Παραγωγή του 2012 και μόνο στην Γερμανία έκοψε πάνω από 90.000 εισιτήρια! Το CineDoc τον Δεκέμβριο μας δίνει ραντεβού στο Παρίσι! Πρώτη πρόσκληση, ένα απόλυτα προσωπικό ραντεβού με τον Λακάν στις 12 Δεκεμβρίου, και στη συνέχεια, στις 19 Δεκεμβρίου, λίγο πριν τις γιορτές, πρόσκληση σε ένα ρομαντικό τετ α τετ με την υπέροχη Ωραία της ημέρας, και του κινηματογράφου, Κατρίν Ντενέβ. Το ντοκιμαντέρ για τον Ζακ Λακάν An appointment with Lacan, του Gerard Miller (Γαλλία, 2011, 52’) σκιαγραφεί το πορτραίτο ενός από τους πιο διάσημους αλλά και αμφιλεγόμενους ψυχαναλυτές στον κόσμο, με μαρτυρίες ασθενών, μαθητών, φίλων και συγγενών. Η προβολή διοργανώνεται σε συνεργασία με την Ελληνική Εταιρεία της Νέας Λακανικής Σχολής. Το ντοκιμαντέρ Cathrine Deneuve, της Anne Andreu (Γαλλία, 2009, 52’) παρακολουθεί τη λαμπερή καριέρα της Γαλλίδας ντίβας και ταυτόχρονα μισόν αιώνα κινηματογραφικής ιστορίας, μιας γενιάς που βίωσε βαθύτατες αλλαγές. Μετά την προβολή, δώρο για τα Χριστούγεννα, θα κληρωθούν τα βιβλία από την ερωτική σειρά των εκδόσεων Μεταίχμιο, μεταξύ των οποίων Η ωραία της ημέρας, Η ιστορία της Ο, Ο εραστής της Λαίδης Τσάτερλυ, και πολλά άλλα. Δύο υπέροχα ντοκιμαντέρ για τον έρωτα, τη ζωή και τις προκλήσεις της, αντίδοτο στους καιρούς που διανύουμε, που κανείς δεν πρέπει να χάσει. Τα ντοκιμαντέρ προβάλλονται παράλληλα στους κινηματογράφους: Δαναός (16.12.2012 και 23.12.2012) τηλ. : 210 69 22 655, Παύλος Ζάννας (9/12/212 και 16.12.2012) τηλ. : 2310 378 404 και Μουσείο Κινηματογράφου Θεσσαλονίκης (12/12/2012 και 19.12.2012) τηλ. : 2310 508 398.